Standing like bastions of their respective fans, one on either side of the extensive Błonia Meadows that stretch from one edge of Kraków’s Old Town to the city’s suburban outskirts on its western side, are the two major football stadiums that have long divided lovers of the sport in Kraków. The largest, is the Wisła Stadium, which, towering over the peaceful Jordana Park, comes alive on game days with a sea of red and blue, when the city itself vibrates with chants and shouts that echo from the stands. Opposite, the smaller, grey-walled Józef Piłsudski Stadium, stands as a symbol of the long and bitter rivalry between Kraków’s two major league football teams. 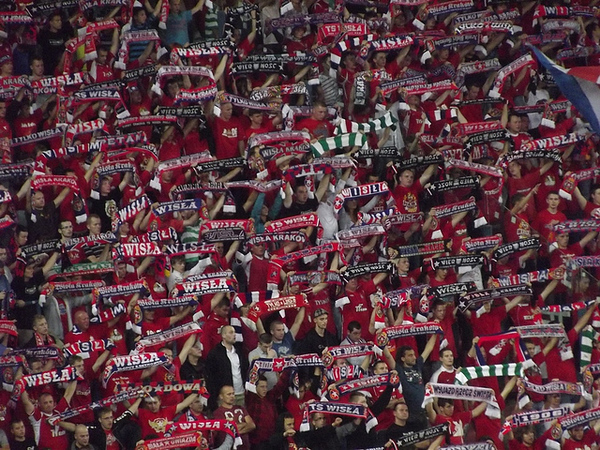 Both compete in Poland’s Ekstraklasa league, and command staunchly loyal groups of supporters the city over. Historically, it’s Wisła Kraków that are the more successful team, but followers of the red-clad Cracovian team, lay claim to Poland’s longest running and most influential football squad, established, as it was, in 1906. The competition is fierce and the Wisła-Cracovia dialectic is one that can be heard all over town. That said, perhaps the most obvious example of rivalry to the visitor can be found scrawled on many of Kraków’s suburban city walls, where the embattlement has carried itself over into the realms of graffiti wall art. In the last 7 years, Kraków’s dominant hockey team, also named KS Cracovia (as the football team), have dominated the national league, securing four of seven first place titles. It’s a relatively new national success for the city however, with the last trophy before 2006 coming as long back as 1949. But, with three of KS Cracovia’s players now listed on the rooster of the super successful national squad, the sport looks to be taking centre field in the city once again. Two hours to the south of Kraków, in the nation’s so-called winter capital, Zakopane, the practice ground for many of Poland’s well known ski jumpers can be found. In 2011, Poland’s most successful jumper, and one of the generally accepted greats of the sport, Adam Małysz, gave his farewell jump from the Tatra slopes in Zakopane. The sport continues to be one of Poland’s most popular, with much of the talent emerging from the practice slopes south of Kraków. For the visitor, there are plenty of options to get involved with the sporting scene in the city. With a real variety of facilities on offer – from park fields to Astroturf football pitches, hockey rinks to open air swimming pools – there’s always something to satisfy your sporting cravings. In the summer the city has two great open air swimming pools, Clepardia and Krakowianka, while the best indoor swimming option is the university owned pool at the AGH, on the west of the city. The most central locations available for tennis and squash courts are provided by TenisKraków, who can also organise tuition. For football grounds, Astroturf pitches are available next to the Vistula banks for a little rental fee, and most sports complex facilities have indoor pitches. In general, Kraków is a very multicultural city, and in recent years the sports scene here has become much more eclectic. Today, one can easily find access to sports facilities that are less ostensibly Polish, like golf or basketball, and, as of 2011, as testimony to Kraków’s branching-out, the city even has its own cricket team!